The Morrow County Sheriff’s Office K-9 program recently received a $1,000 donation from the Bonecutter Family aspart of the Bonecutters monthly Charitable Giving Campaign. Present to accept the donation were Morrow County Sheriff John Hinton, K-9 Handler Deputy James Coulter and K-9 Officer Stormy, with Rockwell and Krista Bonecutter. 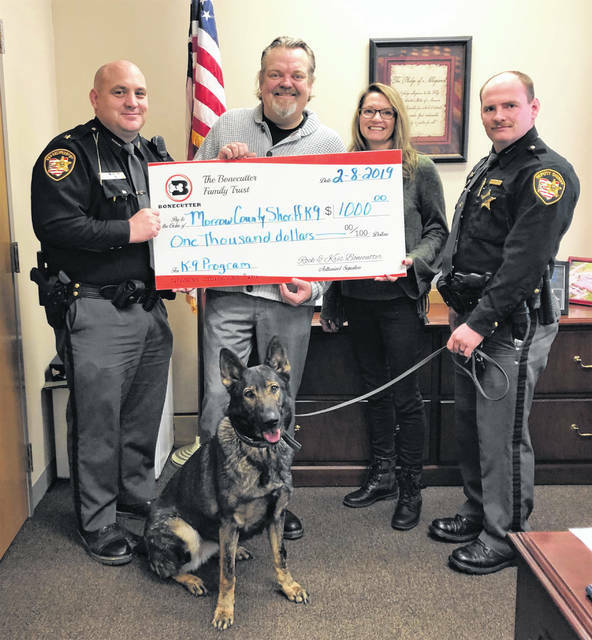 MOUNT GILEAD — The Morrow County Sheriff’s Office K-9 program recently received a $1,000 donation from the Bonecutter Family as part of the Bonecutters monthly Charitable Giving Campaign. Rockwell and Krista Bonecutter presented the check this past Friday. On hand to accept the donation were Morrow County Sheriff John Hinton, K-9 Handler Deputy James Coulter and K-9 Officer Stormy. Sheriff Hinton expressed his appreciation. K-9 Officer Stormy is in her second year with the Sheriff’s Office having been trained in narcotic detection and tracking. She has assisted with a number of investigations over the past two years. Most recently, she was on hand at the drug investigation in Chesterville however her services were not needed once the warrants were executed. “If officers had not been able to find anything, she would have been called in to locate any narcotics,” explained Coulter. The Bonecutter’s are awarding a $1000 donation every month, through the Bonecutter Family Trust, to a group or organization in Morrow County. The Bonecutters are best known for the Bonecutter Plaza located at the I71/95 interchange.